What makes an embroidery hoop good? Below are my criteria for a good embroidery hoop, and later on, I’ll show you how to make a good hoop even better. The purpose of an embroidery hoop is to hold the fabric that’s in it, and usually, to hold it drum tight. For most embroidery (though not all – it depends on the type of stitch), I like my fabric to be drum tight – that is, if I flick it with my fingers, it sounds a bit like a drum. There are different ways to achieve drum-tight fabric for stitching: a slate frame, stretcher bar frames, or a hoop. 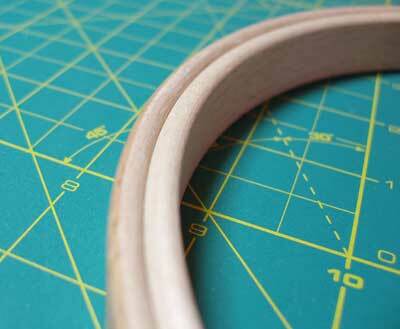 Now, for a hoop to achieve drum-tightness and maintain it for a reasonable amount of time, a good hoop is essential. 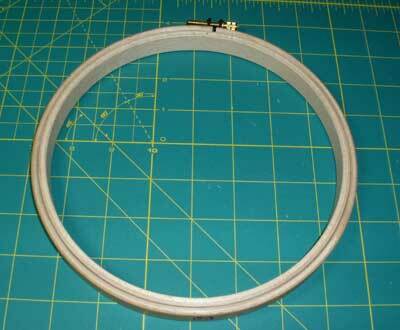 This is a 7″ round wooden embroidery hoop that’s 5/8″ deep. It has all-brass hardware, and the outer ring fits the inner ring very well, without any warping or gapping. The hoop is made from birch wood and is strong and solid – unless you’re super-duper ridiculously strong (like Captain Caveman strong), I don’t think you could bend it out of shape with your hands. It’s got a natural finish and is smoothly polished, so there are no splintery bits that can snag your threads or penetrate your fingers. The hardware is all brass. The brass brackets are not flimsy – they’re strong and durable, and they don’t bend, no matter how much you tighten the screw. The screw has outer ridges that serve as grips for tightening with the fingers, and it also has a slash in it for a screwdriver, so that you can really tighten the thing up. This is a good hoop. The 5/8″ depth is perfect for medium weight fabrics, though I also use it on some finer weight fabrics as well. Muslin, shadow weight linen, dower quality linen – this hoop works with all of them. For heavier weight fabric, like heavy linen twill, I’m more inclined to use a 7/8″ deep hoop, but this hoop actually works fine with twill, too. It’s a good all-purpose hoop in an all-purpose size. The 7″ diameter ring is an easy fit for my hands. Anything larger becomes cumbersome when embroidering the middle of the design. I generally like 6″ and 7″ hoops best. When you buy a hoop, you want to look for one that fits well in your hands. You should be able to hold the edge of your hoop in your palm, secured by your thumb, and stretch your fingers easily to the center of the hoop. Larger hoops (10″ and larger, especially) are generally best managed with some kind of stand to support them (or at least the lip of a table), so that, when necessary, you have both hands free to reach the center of the fabric in the hoop. The hoop featured above is a Hardwicke Manor hoop, made in Germany and imported into the US by Access Commodities. You can find these hoops through many fine online needlework shops. They’re available through Needle in a Haystack. Always take your fabric out of your hoop when you finish a stitching session. Doing so reduces the chance of permanent hoop marks or dirt rings. Plastic hoops with a lip are more prone to dirt rings than good wooden hoops are, though, because the lip tends to catch dust and dirt. When you mount your embroidery fabric in the hoop, consider mounting a piece of scrap muslin or light cotton over your embroidery fabric, with both in the hoop at the same time. Cut an opening in the scrap fabric to reveal your embroidery design. The scrap fabric will further protect the edges of your ground fabric from dirt and hoop rings. It will also protect your fabric from oil from your hands while holding your hoop. Consider binding the inner ring of your hoop for added grip and to protect your ground fabric. Here’s a tutorial for binding an embroidery hoop easily, to achieve better long-lasting tension and to eliminate stress on your fabric. June 16, 2006 Embroidery hoop or frame? I'm not sure if my hoop is that particular German brand, but it is a German hoop. They know how to make them there! I know hoops and stretcher bar frames, but until now have never come across slate frames. What are they and when do you use them? Thanks for the criteria for a good hoop! But question…when one uses a smaller hoop (like 6", which I also prefer) how does it affect your embroidery previously done on the piece? ie, when you move the hoop to a different area and it has to be placed over the work already completed? Did you get an answer to this question? I’m trying to find the answer as well. Whether or not you can move your hoop around over your previous embroidery depends on the type of embroidery you’re doing. For most surface embroidery – just traditional stitches, with floss, where you’re not adding beads or embellishments and so forth – you can move your hoop over your previous embroidery. Just make sure you don’t leave it there for long periods of time! Take your hoop off at the end of each stitching session. Binding the hoop does help protect the embroidery somewhat, but certain types of hoops can’t be bound (like the plastic Susan Bates hoops). You can also add a layer of protection by hooping up a small piece of scrap fabric – like quilter’s music – over your project and in the hoop at the same time. Cut away the muslin from the front of the area you’re going to stitch (be careful not to cut your ground fabric!). This extra covering will give your stitches another layer of protection and it will also keep your ground fabric clean. Some people hoop up Saran wrap over their embroidery, instead of scrap fabric, and just cut away the Saran wrap in the area they’re going to stitch. In any case, you might notice some flattening of stitches, but if you wash the piece or mist it and block it (damp stretch it), the stitches will regain their normal look. I am always trying to find a good hoop. Thanks! Ah, yes, Hardwicke Manor hoops–the best! They may seem expensive, especially when comparing them to the horrible cheap hoops sold in craft stores, etc., but they're worth every penny. The cheap ones are definitely a waste of money (even if they're free! :-). I once crushed one of the smaller ones in my hand without much effort. I've never had much luck with plastic hoops either; they're too slippery or something. I would also caution against Elbensee hoops which are similar and less expensive than Hardwickes, but not as nice. I bought a couple on-line (i.e., sight unseen) and had to use steel wool on them as they were not as well finished as the Hardwicke Manor hoops. They don't seem quite as sturdy either, but are serviceable. I'd rather pay the extra cost, though, and buy Hardwickes. My favourite sizes are 6-8" round, 5/8" thick. They feel good in my hands. The thick hoops are wonderful and just give you a little more to hold on to. I think they hold the tension on the fabric better than the thinner hoops. One last thing: please use a screwdriver to tighten the screw! There's a screwdriver slot for a reason. When I started using a screwdriver to tighten the hoop the improvement in the quality of my work was very noticeable. My stitching tension was orders of magnitude above and beyond what it had been. 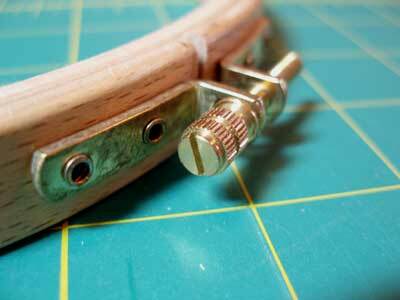 In fact, I recently had to replace the screw on my favourite hoop as I'd worn out the slot from many, many projects. (I was able to get a new screw from Access Commodities via Hedgehog Handworks.) Remember, too, that you have to maintain the tightness of your fabric. You can't just mount the piece and never tighten it again. When you start noticing any play in the fabric tighten it up. Thanks for your comments! Margaret, thanks for the information and endorsement!! I'll be showing you how to bind a hoop and tighten it up in the next couple days, covering as well the question of moving the hoop over other embroidered areas. Slate frames come in smaller sizes, too, and are available through Hedgehog Handworks. Mary, Thanks for all the tips. I just ordered one of these frames. I'm taking your tutorial on shading. I want to get good enough to embroider Icons for vestments and other church adornments. I am very impressed with your skill, your ability to simplify complex tasks to share them with others, and perhaps mostly with your passion to share the art of the needle with others so we can create beauty as well. Thank you! In May, I attended an all day embroidery session called May Day that is organised by my Embroiders Guild. One of the classes I attended a Wessex embroidery workshop with Gay Eaton, and I asked her 'Should I bind my hoop?" 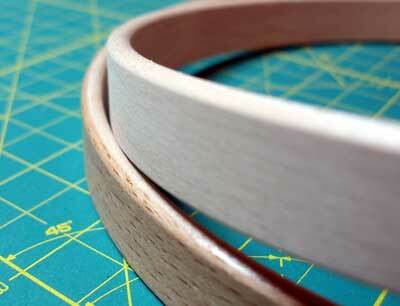 So I eagerly await you post on how to bind a hoop. Margaret C. is right about the hoops; as a beginning surface embroiderer it's made the difference in the consistency of my work. Fr. Nestor: I also hope to embroider my own stole someday (although I love all church embroidery). Wish my church had more of this (we normally don't do vestments). Regardless, it's a beautiful and distinctive art form. I'm taking Mary's shading class, too, and expect to gain some great skills! I have a query but its not related to the current post but something which I am working on currently. Its brazilian embroidery. I don't understand how to secure the back of the stitches(which are mostly bullions, french knots)and I fear that they mighty come undone after a while of using it :(. Since the thread is rayon its quite slippery and knots come undone very easily. I wish you could help in out in this. I have several articles here for beginning your threads. The concepts are the same, even if you aren't stitching on a line. Start the threads the same way, and then cover up your starting point with your bullion stitch. Thanx for your reply. will try it out and let you know how its going. I have recently returned to the embroidery that I first learned as a child from my mother. She taught me with the very old style spring based metal hoops. I am glad to say that I still have several different sizes. They seem much easier to use than those never tight enough screws. Unfortunately mother has misplaced hers and won't use anything else. Any idea where I can get examples of these? Thanks. Maybe you can also explain why they quit making those old style hoops. Hi, Manuela – It could be a matter of your stitches being too tight. Here’s a consideration: how tightly was your fabric bound in the hoop? If it was loose, you’re more likely to have distortion. Even if it was drum tight, were you pulling on your stitches to the extent that they pulled the threads of your fabric a little bit? They shouldn’t do that – if your fabric is drum tight, you want your stitches just to lie on top of the fabric, without pulling. With long and short stitch, it’s often the second layer (and subsequent layers) that might get pulled tight, especially if you build up “too much” layering in the stitches. You can try blocking the piece – dampening it slightly and stretching it out into a square. That might help! I’m so excited. I ordered new embroidery hoops from Hedgehog Handyworks and they have just shipped. All of my hoops are hand me downs from my Mom (and probably my grandmother) or the plastic ones. I fight with them all the time to get them to hold the fabric the way I want them too. I can’t wait. Thanks so much for your very helpful and useful information on all things embroidery! How do you handle the hoop that will lay over stitching….tissue, fabric? I received the table top hoop you recommended for Christmas and am hoping to use it for the hummingbirds. The instructions with the hoop suggest hooping a piece of muslin with a reinforced hole in the middle, then basting your linen to the stretched muslin. So the linen never gets stretched in the hoop, everything stays clean, and you move the linen as you need to embroider through the hole. Do you recommend this method? Hi, Barb – I think you’re talking about the tambour hoop? If so, I don’t think that hoop will be big enough to allow you to mount the linen on muslin and then just hoop the muslin. I could be wrong, so you might try it, but I’m pretty sure it’s too small. If it works, let me know! My old trusty plastic hoop goes into retirement today! I just got my new wooden hoop from Hedgehog Handworks! It’s beautiful. I’m not going to band it quite yet because I’ll need help and my mom doesn’t have the time just yet. Thanks for providing such valuable information. Hi Mary! I believe I have the exact hoop in your pictures (although I think mine is 6″ and I got it from Needle In a Haystack in Alameda. I bound the inner ring with twill tape but for the life of me I cannot get my fabric drum tight in this hoop. It seems like the twill tape is so grippy that it won’t let me “stretch” the fabric tight enough. I am probably going to take the twill tape off and see if that helps but I thought I’d see if you have any advice first! The hardware is very sturdy on my hoop and I have to use a screwdriver even if the screw is “loose” if that makes sense, maybe that’s part of the problem too? It could actually be the thickness of your fabric. For lighter fabrics, a thinner hoop is preferable. But normally, I don’t have a problem even with shadow work linen in this particular hoop. Do you adjust your fabric all the way around, tighten the hoop, adjust again, and then tighten with the screwdriver? This might help. Also, try another layer of fabric – like a light cotton scrap fabric – and mount them both up in the hoop, and then cut a window to reveal your stitching area. This might help, too. Of course, sometimes, with any product, you can get a dud, but I’ve got heaps of these hoops and have never run into a problem with them. If nothing helps, I’d contact the store and let them know, and see if you can trade it in for another one. I don’t know what their policy is or if you still have a receipt, but it’s always worth a try, if nothing else works! I have just come back from Germany, and passed up the opportunity to buy one of these Hardwicke hoops because of their cost 20 euros. I had acquired one secondhand one here in Scotland with out knowing it’s brand/origin it is unbound but is great for keeping tension on the medium twill I have been working with. I was involved with one of the Great tapestry Of Scotland Panels and ended up buying a 12inch quilting hoop unbranded which was great for me,Im 6ft 2 with hands to match. but it was too big for some of the others that worked on the panel with me.The Hardwicke on the other hand is just 8.5 which is great for smaller work. Other groups used other stretching/tensioning methods and these had an impact on the results. for me at the moment I do prefer the hoop and just remove it from the fabric at the end of each session on the larger work to avoid stretch/distortion but otherwise try to work with in the hoop diameter. Hi, Helen – I’ve also seen them, but I think the ones I’ve seen are home made. Mostly, I’ve seen them for q-snaps, more than hoops. One thing you can do that’s easier than buying or making an accessory: take a piece of scrap fabric (cotton muslin or calico works great), and mount it in the hoop over your embroidery fabric, the same time you mount your embroidery fabric. Once everything’s tensioned up the way you want it, cut away an inner circle on that top layer of scrap fabric, to reveal your embroidery area. Leave about an inch (or more, if you have room) on the inside of the hoop area, where you hold onto the hoop. This will protect your ground fabric especially around the ring, where hand oil attracts dust and so forth and leaves hoop marks. I do this all the time – it’s an easy, inexpensive, and good way to protect your ground fabric. Hope that helps! I am a beginner to sewing and to using embroidery hoops. A neighbor expert in sewing did give me a 2 hour tutoring session to help me get started. I explained that I want to sew a microcontroller board plus a string of 16 light emitting diodes (“LEDs”) to a clip on policeman’s tie sold by Amazon. The tie is quite cheap in price and fabric. I would have to sew electronic devices to both the front and back of the tie. My friend unstitched most of the tie, such that it opens up along its fold lines so that you have access to what was the interior of the tie. She suggested I get a very large embroidery hoop of 24 or 30″ and sew the tie to 3 sections of fabric, so that the tie can then be stretched on an embroidery hoop. When I search the internet, I cannot seem to find that large a hoop. 23″ seems about the biggest sold on Amazon. Bearing in mind that I’m just a beginner, do you think a smaller hoop would be okay for this, or do I need some other tool to succeed with sewing devices onto both sides of a tie? I can see that the friend’s idea would give me access to the entire tie all at once which is essential for sewing in electrical circuits. (The thread used is stainless steel, not cloth.) And yes, a clip-on tie is essential. The finished electronic project would not work if it was tied on like a regular tie; the devices would break or tear the tie apart or both. Thank you for your thoughts. Hi, Bob – I’m sure you wouldn’t have any problem binding a hoop with twill tape. It’s really easy. The problem of the tie fitting the hoop is another question. First of all, an embroidery hoop that size is pretty impossible to come by. You might find a quilters hoop at a local quilting shop, though. They are much larger. So there’s that possibility. However, maintaining tension on a quilters hoop that size might be problematic. What about stretcher bar frames? Evertite makes large sized stretcher bars that might serve your purpose better, and since, once assembled, the frame is square, the whole tie will probably fit better. So I’d go with those. First, I’d lay out the tie in the configuration you need, on the ground fabric. Then take the measurement of the layout area of the tie (just the tie – not the fabric) add a few inches on each side, and order stretcher bar frames that will accommodated it. Stretcher bar frames come in pairs. So if your tie in three parts lays out on the fabric at 25″ long by, say, 20″ wide, then you’ll want about a 30″ pair of stretcher bars and a 25″ pair. Then, when you get the stretcher bars, put them together, mount the fabric on the bars (I have a tutorial / review for that here on the Needle n Thread), tack down the tie parts in three pieces as you mentioned, do the final tightening of the bars (you’ll understand what I mean if you read the stretcher bar tutorial), and you should be ready to stitch! The whole tie will be exposed on one flat, stretched surface. If you use the search bar in the left column of the site and search Evertite Stretcher Bars, you’ll come up with the review / information on how they work. The best place to order them is Stitchers Paradise in Florida – Google them – as they have the best prices. You’ll also need to order the T-tool for tightening them, as well as tacks for stretching the fabric. They have a tacking kit called the EZ Tack It kit that will come in handy for this, but there won’t be enough tacks in it for this size project. I usually just use brass thumbtacks from the hardware store. Let me know if that makes sense and if you have anymore questions! Hi Mary — Thank you very much for taking the time to explain stretcher bars to me. They seem exactly what my “lighted up tie” project requires. I have read your tutorial on stretcher bars and located the Stitcher’s Paradise website. I will probably place an order with them this evening. So many thanks for your help! Hi, Bob! Good – I’m glad that helped! If you have any questions along the way, I’m all ears! You can contact me directly, too, via email (mary(at)needlenthread(dot)com). Good luck with the tie! Mi Mary — I did indeed just order stretcher bars today. It will be very interesting to do this project — as I learn more about it, sewing seems just as complex as electrical engineering. Much appreciation for your advice on embroidery hoops! When I was young (long before the internet! ), and lived in a small town where choices for everything were very limited, I got along with whatever I could pick up in the local five-and-dime shop. But now I have the opportunity to find the best — and I don’t know where to look. In a response to your article, Margaret C. endorses Hardwicke Manor hoops; I shall certainly look into these. I’ve also heard that some hoops made in Germany (Edmunds, I think, is one) are of good quality. Is this true? But Mary . . . . is there any particular brand, or brands, of hoops that you would recommend yourself? I’m teaching my daughter now, and this time I want to get everything right! Hi, Deborah – the above article is by me, and yes, I use Hardwicke Manor hoops, pretty much exclusively. Edmunds are ok, but they come in a very limited range of sizes (I’ve only seen the 4 or 5″ available from them). And their hardware doesn’t strike me as quite as good. Hardwicke Manor hoops have a terrific range of sizes and thicknesses. Hope that helps! Help! My embroidery hoop stretched/shifted out of place the threads of the linen hanky I was embroidering. I didn’t see it until I removed the hoop. Is there a way to push the threads back into place? I was thinking maybe taking the needle I used to guide them back over, or maybe getting the fabric wet? This is a gift so I really want it to look good. Just received my Hardwick hoops and boy are they nice. I would venture to say that they are twice as thick as the cheap ones and they almost feel like “furniture” they are so sturdy. Glad I read your reviews of various hoops. Thanks a million. Hedgehog Handworks is out of business. Thanks, Nicole – I just updated that! Previous Previous post: I Forgot Ecru!